At the Little White House in Key West Florida, on 16 May 2014, atomic bomb testimony was delivered in an official forum on Truman ground for the first time. Together with Clifton Truman Daniel, Hibakusha Stories organized an event where Setsuko Thurlow and Yasuaki Yamashita were able to share their experience of being children in Hiroshima and Nagasaki respectively. Thanks to support from the Truman Family, The Little White House and The Harry S. Truman Library and Museum, atomic bomb survivors are now on the official record defending the position that nuclear weapons are immoral no matter in whose hands. 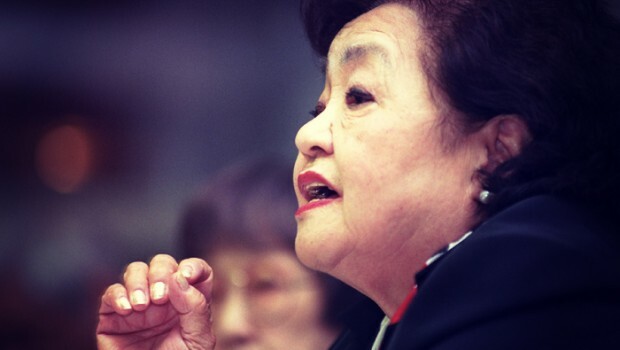 The following is Setsuko Thurlow’s speech from that evening. On that fateful day, August 6, 1945, I was a 13 year old grade 8 student and a member of the Student Mobilization Program, we were at the Army headquarters, 1.8 km from ground zero. About 30 of us students were assigned to work as decoding assistants of secret messages. At 8:15 AM, as Major Yanai was giving us a pep talk at the assembly, suddenly, I saw in the window a blinding bluish-white flash and I remember having the sensation of floating in the air. As I regained consciousness in the silence and darkness, I found myself pinned by the collapsed building. I could not move, and I knew I faced death. I began to hear my classmates’ faint cries, “Mother, help me” “God, help me”. Then, suddenly, I felt hands touching my left shoulder, and heard a man saying, “Don’t give up! Keep moving! Keep pushing! I am trying to free you. See the light coming through that opening? Crawl towards it and get out as quickly as possible.” As I crawled out, the ruins were on fire. Most of my classmates in that room were burned alive. A soldier ordered me and two other surviving girls to escape to the nearby hills. Outside, I looked around. Although it was morning, it was as dark as twilight because of the dust and smoke rising in the air. I saw streams of ghostly figures, slowly shuffling from the centre of the city towards the nearby hills. They did not look like human beings; their hair stood straight up and they were naked and tattered, bleeding, burned, blackened and swollen. Parts of their bodies were missing, flesh and skin hanging from their bones, some with their eyeballs hanging in their hands, and some with their stomachs burst open, with their intestines hanging out. We students joined the ghostly procession, carefully stepping over the dead and dying. There was a deathly silence broken only by the moans of the injured and their pleas for water. The foul stench of burned skin filled the air. We managed to escape to the foot of the hill where there was an army training ground, about the size of two football fields. It was covered with the dead and injured, who were desperately begging, often in faint whispers, “Water, water, please give me water.” But we had no containers to carry water. We went to a nearby stream to wash off the blood and dirt from our bodies. Then we tore off our blouses, soaked them with water and hurried back to hold them to the mouths of the injured, who desperately sucked in the moisture. We did not see any doctors or nurses all day. When darkness fell, we sat on the hillside and all night watched the entire city burn, numbed by the massive, grotesque scale of death and suffering we witnessed. My father left town early that morning, my mother was rescued from under our collapsed home, my sister and her four year old son were burned beyond recognition while on their way to the doctor’s office, an aunt and two cousins were found as skeletons. My sister-in-law is still missing. We rejoiced in the survival of my uncle and his wife, but about ten days later they died with purple spots all over their bodies, and their internal organs seemed to be liquified. My own age group of over 8,000 grade 7 and 8 students from all the city’s high schools were engaged in the task of clearing fire lanes in the centre of Hiroshima. Many of them were killed instantly by the heat of 4,000 degrees Celsius. Many were simply carbonized or vaporized. Radiation, the unique characteristic of the atomic bombing, affected people in mysterious and random ways, with some dying instantly, and others weeks, months or years later by the delayed effects, and radiation is still killing survivors today. Thus, my beloved city of Hiroshima suddenly became desolation, with heaps of ash and rubble, skeletons and blackened corpses. Out of a population of 360,000, most of them non-combatant, women, children, and elderly became victims of the indiscriminate massacre of the atomic bombing. By the end of 1945 some 140,000 had perished. As of now, at least 260,000 have died in Hiroshima alone from the effects of the blast, heat and radiation. As I use the numbers of the dead, it pains me deeply. Reducing the dead to numbers trivializes their precious lives and negates their human dignity. Not only did people have to endure the physical devastation of near-starvation, homelessness, lack of medical care, rapidly spreading social discrimination against survivors as “contaminated ones by nuclear poison”, total lack of service by the Japanese government, the collapse of the authoritarian, militaristic social system, and the sudden introduction to a democratic way of life, but also they suffered from psycho-social control by the Allied Forces Occupation Authority following Japan’s surrender. The Occupation Authorities established the Atomic Bomb Casualty Commission in Hiroshima and Nagasaki, but the sole purpose of this commission was to study the effects of radiation of the bombs on human beings, and not to provide treatment to the injured. Needless to say, the survivors felt they were treated like guinea pigs not once but twice, first as the targets of the atomic bombing, then as the subjects of the medical research. The Occupation Authorities also censored media coverage of survivors’ suffering and confiscated their diaries, literary writings, films, photographs, medical records, etc. – 32,000 items in all. The triumphant scientific and technological achievement in making the atomic bomb could freely be written, but the human suffering inflicted by the atomic bomb was not to be heard by the world. Following the massive trauma of the bombing, survivors had to repress themselves in silence and isolation, and were thus deprived of the normal process of grieving. With the return of full sovereignty to Japan in 1952, a flood of political, scientific, medical and historical information became available enabling scholars, researchers and journalists to see survivors’ experiences in historical perspective and global context. They became aware that the main motive for the atomic bombings was political rather than military. They rejected the American myth that the use of the bombs was necessary to avoid a costly invasion of Japan and saved lives firstly, because the invasion (Operation Olympic) was not scheduled until November 1st, almost three months after the actual bombings; secondly, the American government knew that the Japanese military organization had practically ceased to function; thirdly, they also knew that the Japanese government had made initial overtures for a negotiated surrender; and fourthly, that the unclarified status of the Emperor in an unconditional surrender was the main stumbling block for the Japanese. Also extremely important was the US desire to position itself as the dominant power in East Asia in the post-war period. In addition, some American decision makers wanted to test the new weapons of two different kinds on two cities that had been purposely left intact. With the understanding of the historical perspective the survivors saw themselves as pawns in the opening moves of the Cold War rather than as sacrifices on the altar of peace. On the cenotaph in the Peace Park in Hiroshima is an inscription which reads, “Rest in peace; the error will not be repeated.” What error and whose error were purposely left ambiguous. Although some wanted to point an accusing finger at America, the consensus was reached to see the issue on a higher philosophical plane as a universal need for nothing less than a cultural transformation away from our obsession with violence and war. We Hibakusha, survivors of Hiroshima and Nagasaki, became convinced that no human being should ever have to repeat our experience of the inhumanity, illegality, immorality and cruelty of the atomic bomb, and that our mission was to warn the world about the threat of this ultimate evil. We believe that, “Humanity and nuclear weapons cannot coexist”, and it is our moral imperative to abolish nuclear weapons in order to secure a safe, clean and just world for future generations. With this conviction we have been speaking out around the world for the past several decades for the total abolition of nuclear weapons. In the summer of 1954, I arrived at a college in the US on a scholarship. At a press interview I gave my frank opinion about the US hydrogen bomb test at the Bikini Atoll in the Marshall Islands in the southern Pacific, which caused the Islanders severe public health problems and environmental damage. In addition, the bomb test caused radiation-induced illness to every member of the crew of a nearby Japanese fishing boat, and the death of one member. As a result of my remarks, I began to receive unsigned hate letters. This was my introduction to America. This hostile reaction forced me to do some soul searching. It was a temptation to quit and remain silent, but I came out of this experience with a stronger resolve to work for peace and disarmament. I was deeply disturbed by the way many Americans uncritically and blindly followed the government line justifying the atomic bombings. It was a chilling reminder for me of the wartime behaviour of Japanese in unthinkingly swallowing government propaganda and brainwashing. The failure to see Hiroshima and Nagasaki as atrocities, the regarding of those two 1945 bombs as “good bombs” that contributed to winning and ending a just war helped the American conscience to accept the subsequent development of nuclear weapons, thus linking the justification of Hiroshima and Nagasaki to the disastrous nuclear arms race and cold war. Examining the current reality of the world’s efforts for nuclear disarmament, we hibakusha are dismayed and disturbed at the lack of tangible progress toward the goal. We see the nuclear weapons states’ obvious lack of political will for nuclear disarmament demonstrated by the non-ratification of the Comprehensive Test Ban Treaty; non-compliance with Article 6 of the Nuclear Non-Proliferation Treaty; the 17-year deadlock in the Conference of Disarmament; the failure to negotiate a nuclear weapons-free zone in the Middle East; the continued modernization of nuclear arsenals, etc. Thus, a small number of nuclear weapons states have kept the world as hostages in fear and anxiety while squandering trillions of dollars away from meeting human needs in order to build ever more destructive weapons of mass destruction. This is an intolerable and unacceptable reality. What should be our response to the nuclear status quo? I have shared my painful memories of the impact and consequences of the atomic bombing of Hiroshima. In nearly 70 years since then nuclear weapons states have developed much more sophisticated nuclear weapons, 17,000 of them, enough weapons to kill every one of us on the planet many times over. Is it not about time we do some soul searching, critical thinking and positive action about the choices we make for human survival? I urge you, younger people in particular, to do just that.